I learned about this cobbler recipe from my sister. She made it for a family outing while visiting. It turned out so good that there wasn’t any left over. She said it was a dessert Mom made. I don’t remember her making this rhubarb dessert. I have all my Mom’s recipe boxes so I got them out and starting hunting through them for the recipe. I found it! It said on the recipe in the corner my sister’s name. So between my Mom and my sister this is a forever family recipe. My Turn To Make It! It’s very simple to make. I’m all for simplicity with recipes. The directions are easy to follow. I don’t have rhubarb plants for myself but I’m supplied with plenty from family. I even freeze some for making desserts later when it’s not rhubarb season. All you do is cut up the rhubarb into chunks. Put in the bottom of a cake pan. Sprinkle the sugar and add the topping. I assure it will turns out very yummy when you take it out of the oven. 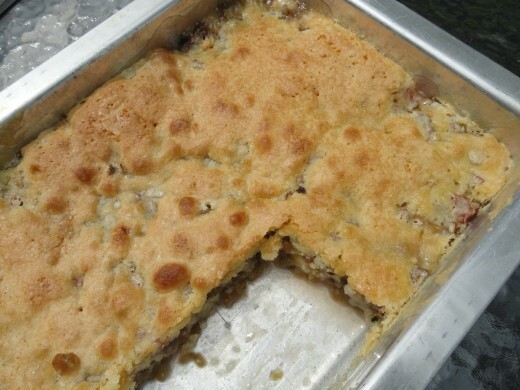 This recipe can be made easily with other fruits such as apples, peaches, blueberries or any fruit you like made cobbler style. Fresh fruits are the best but canned ones will be okay too. It’s truly a great summer dessert. 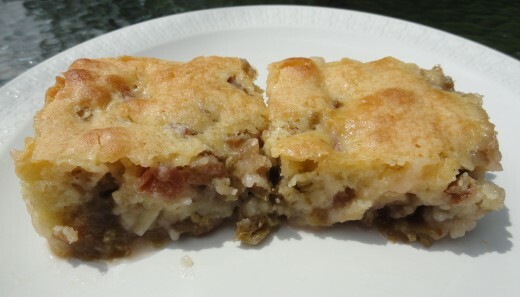 Put the rhubarb in the bottom of a 9 x 13 inch pan. Sprinkle 1 cup sugar over the rhubarb. In a medium mixing bowl, mix together flour, 1½ cups sugar, salt and baking powder. Beat 3 eggs in a small bowl. Melt the margarine. Add both of these to the dry ingredients. Mix well. Spread over rhubarb. How would I adjust rwcipe for canned fruit? This looks delicious! I love rhubarb, well I love most fruits. I don’t grow it but our farmers market has wonderful rhubarb. I don’t make desserts very often now but wondering if I might make this one!